"Problems of nature management, water resources state and environment conservancy under present-day interaction between nature and society" is the basic scientific trend of the Institute research approved by the Presidium of Siberian Branch of the Russian Academy of Sciences. Ecology and rational nature management. The environment monitoring. Decrease of risk and aftereffects of natural and industrial catastrophies. The establishment of Chemal station for complex investigations of mountain territories (Republic of Altai) is planned. Institute for Water and Environmental Problems carries out research activities on nature conservation and environment protection on the assignment given by organizations and government bodies. The most significant ones were the studies performed in 1987-1993 on complex ecological examination of the aftereffects of two large hydroengineering projects realization, namely the Katun hydroelectric station (Katun river, Republic of Altai) and Krapivinsky hydrosystem Tom river, Kemerovo region). In 1992-93 the Institute took part in Government program on the study of the influence of aftereffects of the past nuclear tests on Semipalatinsk Testing Site as well as of anthropogenic environment pollution on human health in Altai Krai. Since 1987 till nowadays the works on the assessment of influence of rocket-space actions on the environment have been conducted jointly with Rosaviakosmos and Moscow State University. The territories of Altai Krai, Republic of Altai, Khakassia and Kazakhstan are the objects under study. Since 1998 the development of scientific bases for the assessment of anthropogenic impact on water bodies has been carried out. At present the Institute carries out works on the development of geoinformation systems to be used by experts in nature management. The series of medical-ecological and ecological-geographical maps reflecting the environment state in the region has been created. The map of special protected natural regions and objects of Altai Krai was made. Medical-ecological atlas of Altai Krai is prepared for publication. In 2002-2003 the Concept of State Program on the use, restoration and conservation of water objects in the Upper Ob basin (2002-2010) and Regional subprograms on the development of hydroeconomic complex of Russia "Water of Russia – XXI century" (2003-2015) were developed together with the Upper-Ob basin Water Department. The development of regional models of sustainable development of Siberian regions, complex programs of regional development takes the important place in the Institute's activity. In 2002-2003 the Institute acted as the major creator of the Federal target program "Ecology and natural resources" in Altai Krai and Republic of Altai. Major kinds of applied research carried out by the Institute are licensed, the researchers have acquired patents and certificates. During 10 years of its existence the Institute has been establishing and maintaining the international relations. The researchers of the Institute take part in international scientific events and visit research centers abroad at regular intervals. Every year the Institute receives foreign scientists interested in joint studies. At present the relations with a number of Universities and research centers in Europe, North America, Asia and Australia are maintained. The Institute constantly participates in international programs on nature conservation. Russian-Dutch investigations of Lakes Chany and Kulundinskoye carried out within the framework of international project "Conservation of wetlands and species composition in the south of West Siberia"
Institute for Water and Environmental Problems, Siberian Branch of the Russian Academy of Sciences (IWEP SB RAS) was founded on September 1, 1987 on the base of laboratories of Academy institutes involved in natural-resources and environment research. Academician Oleg F.Vasiliev, Full Member of the Russian Academy of Sciences, currently the Advisor at the Russian Academy of Sciences, was the first Director -Organizer of the Institute. Since 1995 Professor Yuri I.Vinokurov (Doctor of Geography) heads IWEP. IWEP SB RAS is situated in Barnaul that is the administrative center of Altai Krai. 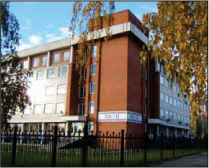 In 1996 the Novosibirsk Branch of IWEP was established on the basis of Novosibirsk complex laboratory of IWEP and research fleet of SB RAS. In 2002 the Gorno-Altaisk Branch of IWEP started its work in Gorno-Altaisk (Republic of Altai). In 1999 the laboratory of geoecological and water problems was created jointly with the Research Center in Kemerovo. IWEP is provided with research vessels on Novosibirsk Reservoir and Lake Teletskoye, Republic of Altai, and a fleet of cars including the specialized mobile laboratory for studying of atmosphere.